Item # 309716 Stash Points: 1,595 (?) This is the number of points you get in The Zumiez Stash for purchasing this item. Stash points are redeemable for exclusive rewards only available to Zumiez Stash members. To redeem your points check out the rewards catalog on thestash.zumiez.com. Take charge of your look and show off your passion for everyone's favorite herb with the HUF Plantlife Yellow and Grey Striped Crew Socks. These plush crew length socks come in a striking design that features a tri-toned striped composition that's accompanied by large, white weed leaf graphics. 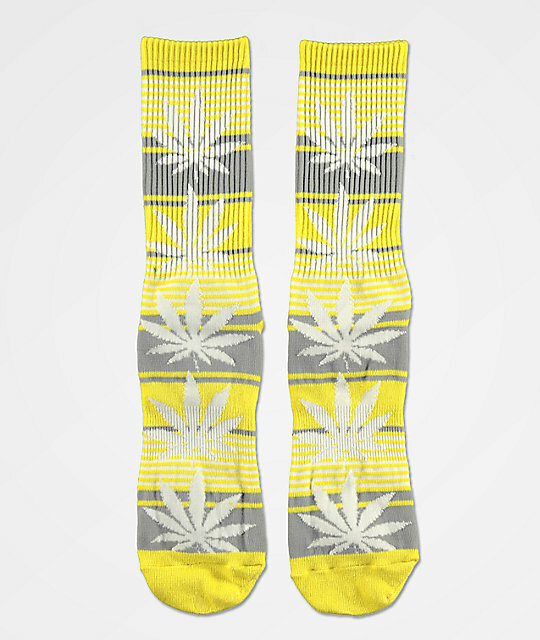 Plantlife Yellow and Grey Striped Crew Socks from HUF. Yellow, grey and white striped pattern throughout. Jacquard knit white weed leaf print pattern throughout.